Poker can be a dogs’ game, too. 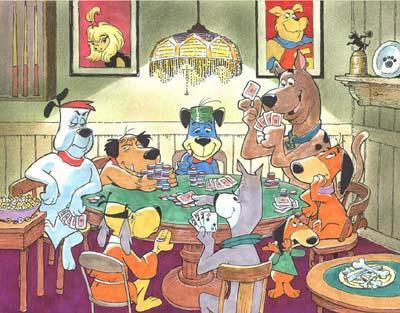 Designed and illustrated by esteemed long-time Hanna-Barbera Artist, Bob Singer, Five Paw Draw features some of Hanna-Barbera’s favorite canine characters, including Scooby-Doo, Augie Doggie and Doggie Daddy, Astro, Huckleberry Hound, Hong Kong Phooey, Reddy (from Ruff n’ Reddy) and Mutley. Though some canines, such as Mutley, had a relatively short run (1969-1971), Hanna-Barbera dogs such as Scooby-Doo has enjoyed an uninterrupted run since 1969.